Saturday night was busy on Everest and by Sunday morning there were over 100 summits from both sides. It will take while to know the exact numbers but the climbing conditions were reported as good as it gets. 120 climbers, advice both Sherpas and Westerners, were reported to be climbing Saturday night just on the South so it appears the expedition leaders did a good job of coordinating summit pushes. By my count there are around 400 going for the summit throughout this season from the South alone this year. No long lines or crowds were reported, in fact, Peak Freaks reported 15 minutes at the Hillary Step so the dual ropes must have made a difference. If you remember last year, there were waits of 2 hours. Thus far there have been four summit days with probably that many more to come. Last year there were less only two the entire season including for the rope fixers. Congratulations !!! Great news. Asian Trekking’s International Everest member David Liano and Sirdar Mingma Sherpa summited Mt.Everest this morning at 4:35 am Nepal time. David Liano is now the first person to complete the double in one climbing season. Asian Trekking family extends hearty congratulations to them and wishes for the safe descent. And heartfelt congratulations also to Pakistani Samina Baig the 1st Pakistani woman to summit. Samina’s brother, Mirza Ali did not summit. I want to mention again the summit by 25 year-old Raha Moharrak. She is the first female and youngest Saudi Arabian to summit. For those following Melissa Arnot, who turned back from her attempt this week, she is back at Base Camp and says she is going to give it another go. This would be her 5th summit, an American female record. Dan Hughes, Jagged Globe, summited and did a live interview with the BBC from the summit. He is trying to raise 1 million pounds for Red Nose Charity and has done an exception job this season. Asian Trekking reported 11 summits on the south. Summit Climb put their team 1 on the South. 7 Summits Club reports everyone from their first team (6+) made the summit from the North. Meanwhile, several climbers went from their Everest summit to attempt Lhotse in a 24 hour period. The charge has been led by AAI Guide, Garrett Madison but also Mike Roberts of Adventure Consultants is in on the action. Plus there is Kenton Cool who has already summited Nuptse and summited Everest along with Dorje Gylgen Sunday morning will go for Lhotse as well. This would be a first if Kenton can make all three is the same push. Woody Bailey becomes the youngest person to summit two 8,000 meter peaks in under 24 hours, a nice present for his 23rd birthday tomorrow! Alpine Ascents Expedition Leader Garrett Madison becomes the first person to have done two 8,000 meter peaks in under 24 hours twice, having also done so in 2011. Karma Sarke Sherpa and Ang Passang Sherpa become the the first Sherpa to do so. Alpine Ascents Guide Ben Jones and climbers Michael Grigsby and Martin Grieder have also completed the two summits in under 24 hours bringing the total number of climbers to have done so to only nine. Garrett, Ben, Woody, Michael, Martin, Karma, and Ang Passang can look across the South Col and up the Mt. Everest to the peak they were all standing on less then 23 hours ago. The weather is clear, the winds are calm, and it sounds like another amazing summit day for our climbers! After five hard days of rope fixing by Tashi, Ngima, Rita Dorjee and Phinjo Sherpa, our three members Ellen Miller, JingWang and your blogger Billi Bierling as well as our guide Francoise Marsigny summited this technical 7,864m peak on 16th May. “I am so happy we did it, however, without the ropes fixed by our Sherpas, this dream would not have come true for us,” said Ellen Miller from the United States. The British mountain guide Kenton Cool and the Spanish mountaineer Alex Txikon also took advantage of the fixed ropes and summmited the same day. “The Sherpas did a great job and the route was fantastic,” I heard Kenton express his gratitude for the rope fixing via the radio to Russell. Himex is looking to summit Everest on May 23rd at the end of the weather window. Congratulations to everyone. Look for more summits starting Sunday night for Monday morning, May 20th. It’s not over ’till it over! Finally take a look at Everest from the webcam. I believe the twins nungshi and tashi from india have also summitted as per times of india this morning and they were accompanied by twin sherpas .both a first . I trekked from lukla to the base camp with them and they were bubling with energy , full of life ,enthusiasm and confidence . Fantastic news !!! Congrats to all the climbers. A safe descent to everyone. Did the any or all of Nuptse team summit with out O2? David, I don’t think so but am not 100% certain. Given it is 7864m/25,800′ and that these were experienced climbers who had summited Everest in the past, most likely they did not but again, not sure. I’ll try to find out. So you think all Nuptse submitters used supplementary O2. Then its a tragedy in my opinion. A mountain like Nuptse with such a rich history of true alpine style climbing is now polluted and available for any one with cash to pay for their way up. Its a disgrace. It breaks my hart to see this happen and its lack of respect to all who has failed trying Nuptse in the best of styles. When I’m at it its TRULY outstanding that Samina Baig and Mirza Ali summited with out O2! That must be the single most impressive achievement this season given how much work they did on there own on a very tight budget. I lift my hat for them! David, please read my reply carefully, I said I don’t think they used supplemental oxygen on Nuptse. And yes sincere congratulations to Samina nad Mirza. Ok, sorry, I’m not native in English and I did not quite understand your response. Thanks for clarifying, much appreciated Allan! Fantastic! So thrilled for everyone,be it the normal summiteers (if there is such a thing) and the record breakers! Huge congrats to all,and good luck to all still going for it. Needless to say prayers are also with them for their safe return. Alan is this year unique in the amount of records being set? And once again thank you for all the updates Alan. Thank you for the update Rakesh. Wishing the kids well and hope they make it. It would be amazing! The team had seven boys, six summited, one was ordered down from the balcony, when his oxygen gave some trouble. On his part he displayed excellent mountain spirit by not insisting upon climbing on. They are all now back in school, studies are now priority. The seventh boy, Hakikat is going to climb again after his final school exams in april 14. India is now getting its youngest generation of mountaineers in the making. We wish them best of luck for safe and enjoyable summittings. We all stayed on in camp 2 during the boys climb. 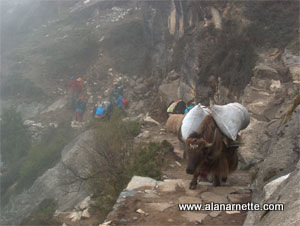 We eyed Nuptse with great detail, perhaps…next year we will attempt one of the three. Great to see the Live BBC feed from the summit. How is it going with Kenton Cool and his triple summit attempt? Fantastic. And congrats to David Liano!